There was just one game in the Moralee Conference at the weekend and Blackburn Hawks moved further ahead at the top of the table with a 2-5 win away at Solihull Barons. They now lead Whitley Warriors by three points and have a game in hand. 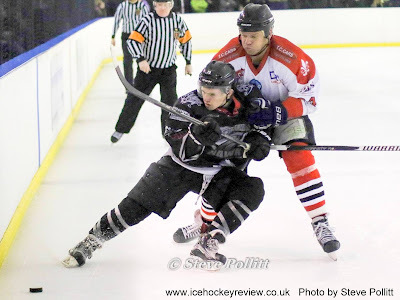 The weekend before Christmas saw the Hawks pick up three more points – winning 5-2 at home to Billingham Stars on the Saturday and then grabbing a dramatic last minute equaliser away to Whitley in a 4-4 draw. Solihull Barons moved up to 3rd place in the table after a 9-4 home win over Sutton Sting and remain in that position after their game against the Hawks. Sheffield Spartans and Sheffield Senators had back to back “home and away” games at iceSheffield the weekend before Christmas and, while league points were the priority, they decided to use the occasion to also play their annual Winter Classic fixture as a two leg affair. The Spartans won the Winter Classic cup last year and also triumphed this year winning their away game 3-7 and then winning the home tie 10-2. So the cup and 4 important Moralee Conference points went to the Spartans.